The compelling personal story of a teenage girl who stood against her family's faith to convert to Christianity and who gave up everything in her flight from religious persecution. In 2009 the story broke in national media of a teenage girl who had run away from her Ohio home, claiming that her Muslim father had threatened to kill her for refusing to renounce her Christian faith. Her parents denied the charges and fought to have her returned home, but she became a ward of the state, placed into foster care until she was emancipated at age 18. Today that girl is a young woman still living in an undisclosed location, still convinced her life is under threat, and still passionate about following Jesus, despite the risks. Teens and young adults will be moved by Rifqa's story of standing up to religious persecution, literally giving up everything to follow her faith. 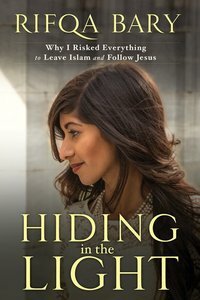 About "Hiding in the Light: Why I Risked Everything to Leave Islam and Follow Jesus"
Rifqa Bary, a native of the Indian sub-continent, moved to the USA as a teenager. Her passions are prayer, studying the Bible, and serving the poor. Customer Reviews For "Hiding in the Light: Why I Risked Everything to Leave Islam and Follow Jesus"
This is a story that needed to be told. I couldn't put the book down and it certainly tugs on the heart strings. Rifqa's story has given me insight into another culture, and an appreciation of how good I've had it. I'll carry her story with me as I deal with those from Muslim backgrounds in my work. This biography shines a light on and gives you awareness for how dangerous it is for a Muslim to convert to Christianity. More than that though, it shows you the power of God in reaching His precious children and leading and loving them. Rifqa's courage and faith through the whole story is incredible and strong. This is a challenging book to read. Excellent book - gripping. I could not put it down. This book had me from the first page. It gave an insight into the life of a Muslim girl and her family. The change in the attitude of the family to her when she sustained an injury which blinded one of her eyes, her walk away from Islam into Christianity all very well told. When she had to actually run from her family in fear of her life it was so gripping I could not put it down. A great book, I can recommend it most highly. You will not be disappointed.